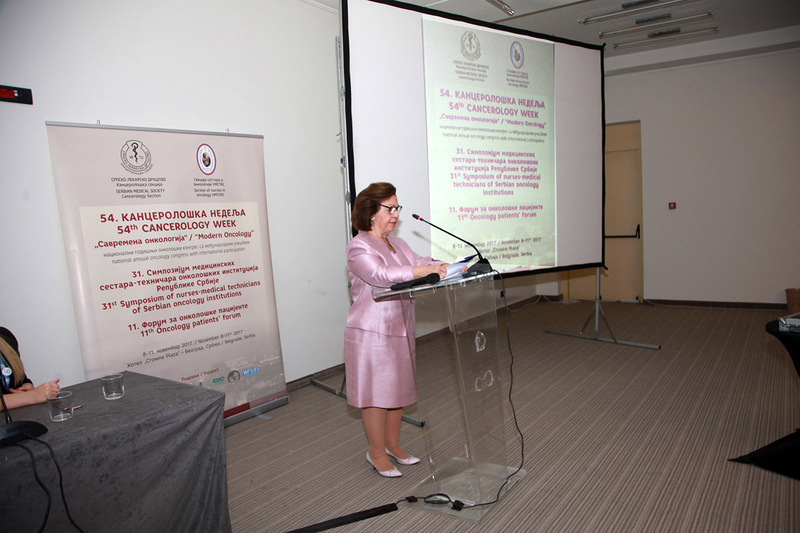 Her Royal Highness Crown Princess Katherine officially opened the 54th Cancerology Week “Modern Oncology” organized by the Serbian Medical Society Cancerology Section, in Crowne Plaza hotel today. This national oncology congress is organized each year to raise awareness and discuss the issues of oncology treatments, present up-to-date treatment recommendations and best practices, as well as to point out to challenges doctors and patients are facing. The conference is considered to be one of the most important oncology gathering in the country and has been gathering some of the most eminent experts in this medical field, from Serbia, region and abroad. This year, it was officially opened by prof. Radan Džodić, MD, PhD, President of the Cancerology Section, and academician prof. Radoje Čolović, President of the Serbian Medical Society. Speaking at the opening, HRH Crown Princess Katherine congratulated the organisers for another successful conference emphasizing the importance of discussing cancer prevention as well as the latest developments in practice. “Just recently, we were able to provide a digital mamography machine of last generation worth $300.000 and patient monitors for children’s oncological Neurosurgery Clinic in Belgrade. I am proud to announce that we were able to deliver four new sterilizers for four hospitals in Serbia with the help of Foundation CURE from the United States worth $1.400.000. Both my husband and I are driven in our charity work by the fundamental need to help our fellow citizens and hope to make a difference, because every step matters in the long run”, said HRH Crown Princess Katherine. This year’s conference will focus on novelties in treatment of soft tissue sarcomas, parathyroid and adrenal gland cancer, thyroid carcinoma in children, as well as oncoplastic approach in surgery. In accordance with the principles of multidisciplinary approach andteamwork, along with 54th Cancerology Week, 31st Symposium of nurses and medical technicians fromoncological institutions in Serbia, as well as 11th Cancer patients’ forum will be held.